Angela Shope combines her love of painting with porcelain ceramics. She is a utilitarian ceramic artist and fine artist exhibiting paintings and ceramics both locally and nationally. It was her delight to be recognized as a favorite emerging artist in Lancaster, Pennsylvania where she was born and raised. Angela received her BA in Fine Art from Millersville University, Millersville PA and attended Chatauqua Institution of Art in Chatauqua, NY. Angela has been an Artist in Residence for painting and also for ceramics at Millersville University. Currently, she is a self employed artist and resides in Lancaster, PA. Starting out with a strong background in painting and drawing was key for her development as an artist. 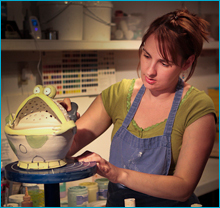 While working at Millersville University as a Resident Artist for painting, Angela took one ceramic class and was hooked! The following Summer she attended Chatauqua Institution for painting and was excited to be able to continue working in ceramics while she studied other art forms. 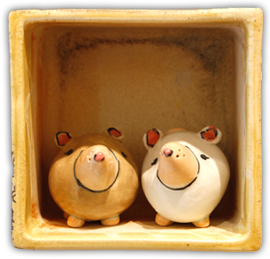 She found the sense of community and comradery that exists in the ceramic art world refreshing. Many hours in the studio and the vast educational network in the ceramics community have been priceless assets to her continuing development as an artist, as well as the support of family and friends. Several years ago Angela and her husband put an addition on their home, and Angela moved her uptown studio into their home creating a working studio space and small gallery there. She continues to explore and exhibit several different mediums including ceramics, paintings, drawings and collage at fine art galleries and juried fine craft shows. Angela has an interest in all types of gardening, world travel, art history and bringing the art world and surrounding community closer through charitable causes and benefits. With a sense of humor, a love of beauty, and a respect for history Angela strives to bring together the appreciation of fine art and functionality.